What I Want to Show. What I Don't Want to Show. This short story was available only as a gift with purchase of GH2 keychains at the 2014 Animate Girls' Festival event. I was lucky enough to find someone who was attending the event and who was willing to do pickups, so we were able to get all three of the stories! 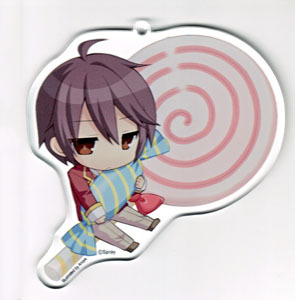 This one is for Tomo and goes with the cute keychain of Tomo with candy and a lollipop. The story itself, though... well, just read it. "Hey, Tomo. Tomorrow, why don't we go out together?" "Go out, you mean outside the school?" "Yeah. Since all the trouble in the school has died down, I thought it might be nice to go outside sometime. Is there a shop or something you want to go to?" Then it would be a date... Tomo murmured, considering something. I was startled at hearing the word date come out of Tomo's mouth. ... That's right, since I'm going out with Tomo, going on a outing with him would be a date. When I thought of that, naturally my face got red. Without noticing that, Tomo suddenly raised his face. "Instead, Yuki... is there... a shop or something you want to go to?" Tomo's words seeking confirmation were somehow indistinct. I felt like it was his usual indifference, but a little more caught in his throat. "... Tomo? Could it be, you're not really interested?" Smiling bitterly, Tomo scratched his head and looked hesitant to speak. "If it's inconvenient, we can do it another day." Looking troubled, Tomo ruffled my hair and combed through it. "I don't mind going out with you. I think I want to go too. But... until now, I haven't gone out with friends my age very much, or gone on a date or anything. I can't think of where to go or what to do...."
"It's not something you have to get so worked up over. Anyway, I don't really know what makes a proper date. I think you don't have to think about it too seriously." What, so that was what he was worried about. I was a bit relieved that it wasn't that he didn't want to go out. "Oh, there's just one place I want to go with you." "Umm.... It's not a very date-like place, but if possible, I'd like you to come with me." And so the next day was Sunday. Tomo and I went to a low hill, facing across the ocean to the school island. "This place has an amazing view, Tomo. I can clearly see the school." "Yeah, that's right. When he was still alive, people said Brother said he wanted to be here. Because if he was here, he said even after he was dead, he could always look out over the school." The place Tomo had taken me to was his brother's, Nao-nii's, grave. From here, the windows on the server building where the director's room was looked small. "Actually... I should have come here more often. But, I couldn't really put my feelings in order, and I haven't come here since his ashes were put to rest. Even though I took over being the director from Brother, I've just tried to run away. So I've felt guilty.... Besides, when I come here, everything I've been suppressing comes flowing out, and maybe I was scared...."
I couldn't find any more words than that to say, so I fell silent. But Tomo, who was facing the gravestone, turned to me and smiled with a slightly troubled look. "But, you realized that I was suppressing my feelings and set me free. So it's thanks to you that I was able to come here, Yuki. I'm fine now. Now, we can properly face each other." Tomo once again turned towards Nao-nii's grave. "I'm sorry, Brother. But from now on, I intend to be the kind of director you don't have to worry about. So watch me from here." Tomo's face as he talked to the gravestone was wet with tears. "Yuki.... All I do when I'm with you is cry." "Don't... worry about it... *sniffle*.... If you... say that... *sob*... then even I'll...."
I wiped my face that was drenched with tears of sympathy with the back of my hand. "Haha. Yuki, what's with that face? You're worse off than I am." "Ahaha, your nose is running and your face is getting all dirty." "That's so mean. I was really moved and you're making fun of me...."
Even as I complained, I laughed along with Tomo. With tear stained faces, the two of us laughed out loud, enough to make our stomachs hurt. We remembered how, long ago, Nao-nii would watch over us with a gentle smile as we fought over silly things, and cried and smiled. Leaving behind the hill with the grave, we went back to the school island. As the sun began to sink, the two of us gazed through the window of the director's room at the hill where Nao-nii slept. "I wonder if Nao-nii can see us from there?" "When I think that from now on, Nao-nii is always watching over you and me, and everyone at BL School, somehow I stop feeling uneasy." "Right. Only, when I think that he's always watching, it makes it hard to skip class." "If that's how you feel, then don't skip class." Retorting that those two things were different, Tomo sat down in the director's chair and spun around. He turned once and when he faced me again, he clasped both of my arms. "Yuki, thank you for coming with me today. Even though it wasn't a very date-like place." "Don't worry about it. I wanted to see Nao-nii too. I've always wanted to thank Nao-nii. For inviting me to this school and letting me be able to to meet you again." "For that, I really have to be grateful to Brother." Tomo's grip on my arms grew firmer and he pulled my body close, whispering in my ear. "Hey, Yuki, you were looking forward to a date today, weren't you? So why don't we do something date-like?" As I stood puzzled, Tomo caught my chin gently and kissed me. With Tomo grinning in front of me, I felt my face get hot all at once. I nodded deeply and waited for another kiss from Tomo. But right before our lips touched, Tomo stopped. Tomo said wait a minute and stood up, closing the curtains of the director's room. "When I think that Brother is watching, it's somehow, you know." "Well, as family, I don't mind showing you off, but as my lover, you're mine alone." The director's room had become a space for just the two of us, and once again, Tomo's face came close. Tomo's lowered lashes were right in front of me and I savored the soft sensation of the lips touching me. As we both felt each other's heat through our lips, slowly my view changed from the closed curtains to the ceiling.